Arizona has been fortunate that, as it, and the country, climbed its way out of the Great Recession the consultants and contractors who support the chapter have been able to again provide generous financial support. That support, combined with good fiscal management of funds, Arizona's share of the proceeds of the inaugural 2015 PWX, and successful annual conferences in the following years, the chapter has accumulated a surplus of funds that we were carrying in our general checking account. The chapter also had a couple of small investment accounts that were not performing as well as some other options. In 2016 – 2017, the Finance Committee, at the direction of the Board, looked into several higher-return investment vehicles. After some careful consideration, the Board directed the creation of the "Board Discretionary Endowment Fund" and reinvested about $101,000 of low-yield cash reserves into this fund, which is managed by Wells Fargo Advisors. As defined by the Board, the purpose of the fund is "to provide a strategic reserve for the chapter to be used solely at the board's discretion for financial emergencies and the endowment for special events, scholarships, grants, and/or awards to individuals and/or organizations whose actions will advance the purpose of the association and the public works profession." The fund has a moderate growth strategy that puts a priority on preserving the principal while still providing a reasonable return on investment (ROI). In the first year, the ROI was 9.1 percent, and while there was a short-term drop due to the market corrections this past fall, the earnings this year have returned the fund to just short of the pre-correction high. Having cash reserve of up to 35 percent of the annual budget is recommended by APWA national as a chapter best practice. At the 2018 PWX last summer, I attended several financial workshops and Arizona's Endowment Fund is consistent with investment funds/reserves held by a number of successful chapters. In fact, APWA national has contracted with an investment manager and has said chapters can piggyback on that relationship if they care to. The Board has taken that offer under advisement. Right now the Board is considering how best to make "…endowment(s) for special events, scholarships, grants, and/or awards to individuals and/or organizations whose actions will advance the purpose of the association and the public works profession…". The Board would like to hear from the members about where they feel the earnings should be spent. Some ideas are to give out additional scholarships to students pursuing a career in public works; provide financial aid to help folks attend either the state conference and/or PWX; and give money to one or more charities, such as St Vincent de Paul, Wounded Warriors, or one or more food banks. In addition, one of the PACE qualification criteria requires that a chapter "annually … organizes and/or participates in a minimum of two community/environmental service events, one focused on an environmental project and one on a community-based project." Proceeds from the Endowment Fund could help fund these types of activities. If you have thoughts, please reach out to one of the Board members. A survey may be sent out soon to solicit feedback from the members. Multiple activities could be funded annually or on a rotating basis, depending on ROI & feedback from the members. The APWA Arizona Chapter is proud to announce the selection of Beth Huning, City Engineer, City of Mesa and Jennifer Toth, Director, Maricopa County Department of Transportation as this year’s winners of the APWA National Top Ten Award. The purpose of the Top Ten Public Works Leaders of the Year program seeks to inspire excellence and dedication in public service by recognizing the outstanding career service achievements of individual public works professionals and officials, from both the public and private sectors. The award presentation will take place at the APWA Arizona Chapter Monthly Luncheon on May 15th. Alexandra Garner Aztec Engineering, Inc. Describe your job responsibilities: Procure and manage public works projects, marketing and business development for new work, and managing in-house staff. What was your favorite project to work on in the last 10 years? Construction Administrator for the US 2 Widening Project from the Montana State Line to Junction US85, North Dakota Department of Transportation. As CA for the 17.7-mile widening, asphalt rehabilitation and concrete overlay roadway project, I was responsible for the contract administration, inspection, materials sampling, and project office documentation including preparation of all scoping documents, coordinating the project startup with project stakeholders, managing the consultant field staff, providing senior oversight, and preparing consultant and contractor billing documents. Due to the weather-related shortened construction period, the project was completed in five months (except for landscaping, which was installed after the next spring thaw!). What Challenges do you experience in your role? One of my biggest challenges in my role is interfacing with the public, being able to take what I know and translate it to others, who do not understand what I do on a daily basis. What benefits do you get out of being a member? One of the biggest benefits of being a member is the network of colleagues you develop. Connections with municipalities, consultants, contractors, etc. provide you with opportunities to reach out and discuss problems or issues and find various solutions or ideas that you may not have thought of. It gives you a network of people to discuss industry changes with and have an opportunity to hear others viewpoints. What would you like to share with APWA Members? I would suggest getting involved in a committee. 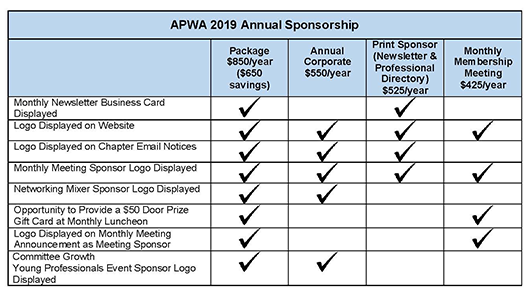 It is one of the best ways to develop more personal connections with others involved in APWA as a whole. Tell us about your family and hobbies: My family keeps every minute that I am not at work busy. I have two girls that play competitive soccer, which requires my husband and I to attend countless nights of practice and endless weekends of games and tournaments. We try to plan a family trip at least once a year to help break up the chaos that seems to be our daily lives. But, whenever we need a quick slowdown from the day-to-day grind we have a family night where everyone pitches in and helps cook dinner and pick a movie for all of us to watch. Those are my favorite days! The communications committee’s March newsletter contest was held at the luncheon. Our question of the month was: “What Upcoming Event was posted for April 7th in the March newsletter?….the answer was The Family Picnic. The winner received a starbucks gift card donated by Wood/Patel. Read the upcoming newsletter to prepare for next month’s question. This section allows agencies to advertise their open positions. Please provide your advertisement and/or link to sniebel@woodpatel.com or tbaker@logansimpson.com. A Real Estate Services Supervisor is responsible for assisting the Real Estate Services Administrator in managing the property acquisition and property management functions of the Real Estate Services Group, including performing highly specialized, sensitive and high dollar real property acquisition work. A Construction Inspector I performs quality assurance inspections on a variety of civil engineering and public works projects completed by the City, private developers, and utility companies, ensuring the projects meet appropriate City and industry standards. The City of Chandler and the Chandler Fire, Health & Medical (CFHM) Department opened a state-of-the-art training facility to serve the organization’s 214 sworn firefighting personnel, along with personnel from several neighboring and regional firefighting agencies. The Fire Training Center Expansion – Burn Building project was built within the City’s existing Fire Training Center at 3550 S. Dobson Road. The Fire Training Center Expansion – Burn Building project was designed to provide firefighters the ability to train in real fire conditions within a structure that mimics the appearance and function of four separate building environments that firefighters might encounter in the community. It was originally designed in 2009, but due to the economic downturn caused by The Great Recession the project was shelved until a design update was funded in 2015. Protecting the environment during the project - Dust control permits for the project were obtained by the contractor from the Maricopa County Environmental Services Department and dust mitigation procedures were followed. Special consideration was given and additional measures taken when concerns were raised by an adjacent property owner (Intel) with industrial operations that are highly sensitive to dust. These additional steps were taken even when the dust causing the concern was generated by multiple construction projects in the vicinity, and not from the Fire Training Center Expansion – Burn Building project. The project contractor implemented best practices for a Storm Water Pollution and Prevention Plan (SWPPP), even though a permit with Arizona Department of Environment Quality was not required due to the limited size of the project’s square foot area of disturbance. The site’s installed SWPP protections received regular inspections by City of Chandler Storm Water staff and City inspectors. These inspections were to ensure proper designated washout containers and filters/barriers were maintained and in place to protect the underground aquifer from construction site material contamination via any of the site’s drywells and retention areas. Challenges - A significant challenge that had to be addressed was the project design update that had to be completed prior to the start of the project. This project was originally designed in 2009, but due to the economic downturn caused by The Great Recession, the project was delayed. When economic conditions improved, the design update was funded in 2015, and construction began in early 2016. Additional conditions deemed of importance to the public works agency - The specific training capabilities and safety features required to receive classification as a Class A training facility required unique expertise and quality control diligence on the part of the contractor, inspectors and CFHM Department staff. For example, the project includes highly specialized burn building training equipment and systems, such as high temperature linings, smoke exhaust systems, and Apollo automation controls. These distinct features required the use of specific subcontractors with unique capabilities and experience to install them. Project Impact on the Chandler Fire, Health & Medical Department - With 255,464 residents, Chandler is the fourth largest city in the State of Arizona. The rapid growth Chandler experienced over the past few decades has brought an evolution in population density, building use, construction methods and service delivery needs of the community. In addition, materials used in homes and businesses have changed and now include many more plastics and man-made products which burn differently than materials of the past. The environment a firefighter must work within during a fire attack is created by the variables of the building such as entrances, exits, floor layout, height and occupancy type. Moreover, the fire itself, which includes the size, intensity, location and products of combustion, create a critical component of this environment. The Chandler Fire Training Center Expansion – Burn Building project was designed to address these variables and provide firefighters the ability to train in real fire conditions within a structure that mimics what firefighters see in the community. This unique structure was designed through a collaborative process which included a committee of firefighters. The result was a one-of-a-kind training structure which offers the appearance and function of four separate building environments that firefighters might encounter during usual fire situations in the community. The north face of the structure presents a warehouse front with a loading dock and metal roll-up doors that open into a large open room resembling a “big box” retail or industrial environment. The west face presents a single-story strip mall with multiple suites and entry points. The south face presents a two-story home with an additional full basement as well as a single vehicle garage. Lastly, the east face presents a three-story multifamily structure with an exterior stairwell and shared hallways. The design of this 9,000-square-foot building greatly enhances the training capabilities of Chandler firefighters as well as several other area fire departments that CFHM trains at this regional training center – Gila River Indian Community, Maricopa, Sun Lakes and others. Not only does the design impact training technique, the type of construction materials also allow the department to make training scenarios more realistic. Most burn buildings across the nation are gas fed, producing safe and controllable fires. However, “safe and controllable” does not accurately replicate real fire, smoke and heat conditions. Sections of the new burn building use special ceramic high-temperature tiles to enable the burning of real combustible materials, such as wood, paper and fabric. It is the ability to burn real combustible materials that gives this training facility Class A status. The primary reason for the prevalence of gas fed fire training buildings is related to the safety features available. Gas fed training props can be shut down with a push of a button, making them ideal for basic training scenarios. A combustible fire training building is intended to burn real materials and creates an authentic and more dangerous fire with thick smoke. These scenarios are far more realistic and better prepare firefighters for actual events, but the risk has always been a concern. The Chandler design team worked diligently to keep a sharp focus on training safety. They understood that a clear deficiency of older training buildings that use combustible materials was the lack of safety options. To assuage these concerns, the new fire training building is equipped with an advanced exhaust system. With the push of a button, training staff can open up the building, increasing light and fresh air, while simultaneously initiating exhaust fans which remove super-heated gasses and harmful products of combustion. This feature offers a built-in mechanism to enhance safety during these training scenarios. Another innovation within this structure is the ability to train other firefighter skills. CFHM is an all- hazard organization, which includes specialty disciplines such as hazardous materials and technical rescue. The new building offers attachments for high angle rescue as well as areas for confined space rescue training. It is also one of the only training facilities in Arizona with a basement, a very important feature in a growing region where basements in new homes are increasing in popularity. The result is a structure as versatile and dynamic as the services delivered by a modern, professional fire service organization. The Chandler Fire Training Center Expansion – Burn Building project was funded primarily from voter-approved bonds, which demonstrates the confidence voters have in the City’s fiscal leadership and the community’s commitment to the safety of the men and women protecting the people of Chandler and the region. The Metis Center for Infrastructure and Sustainable Engineering’s at Arizona State University is pleased to announce the first Sustainable Infrastructure Awards. The award is intended to highlight cutting edge infrastructure practices that drive sustainability including those that address environmental, social, or emerging technology challenges, or the growing complex environments that infrastructure are expected to operate in. Phoenix-area infrastructure professionals from public, private, non-profit, and academic organizations are invited to submit their nominations. Nominations are limited to one per organization. Nomination packages will be reviewed by the Metis Center faculty. Awardees will receive a plaque acknowledging the innovative efforts of the organization on the nominated project. Nomination packages are brief (about two pages) and should conform to the precise requirements described within the form. In general this includes the project champion/contact, a short description of the project, the challenges that were addressed, and the sustainability outcome. It is due by 5pm MST on Friday, April 19, 2019. The nomination package should be uploaded as a single PDF file and include the completed two page nomination form plus any supplemental material (project photos, letters of support, and project documentation). Supplemental material is not required. This nomination only needs to be a minimum of 2 pages, and can be any project in the area. To submit nomination packages and find more information, visit https://metis.asu.edu/awards/. IMPORTANT NOTICE: This e-mail message is intended to be received only by persons entitled to receive the confidential information it may contain. E-mail messages to clients of Wood/Patel may contain information that is confidential and legally privileged. Please do not read, copy, forward, or store this message unless you are an intended recipient of it. If you have received this message in error, please forward it to the sender and delete it completely from your computer system. ELECTRONIC CORRESPONDENCE NOTICE: Please see http://www.woodpatel.com/policies for policies regarding this transmission.